"Help Thomas figure out the mysteries of his existence"
Game Goal: You have to help Thomas, a red rectangle, to discover the mysteries of life and friendship through different levels of platforms where you have to use all of your wits. 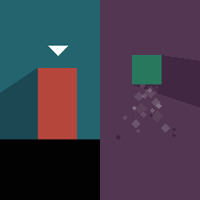 How to play: On each level you have control of Thomas and other geometric figures that you must move and place in a hole with their respective ways to move to the next screen. Graphics: They are minimalist but have good quality and their animations are very fluid. Sound: It has great quality, with a nice background music that fits the graphics and environment. Developer: Bossa Studios Ltd is based in United Kingdom	- Trusted, high-quality developer. Ranking: The TOP 5 Most downloaded games in Shape Game category. Has a different story than expected in these types of games. Very original, appealing minimalist graphics. Can be difficult to swap between characters. At first glance it may seem a little expensive. Do you like Thomas Was Alone?